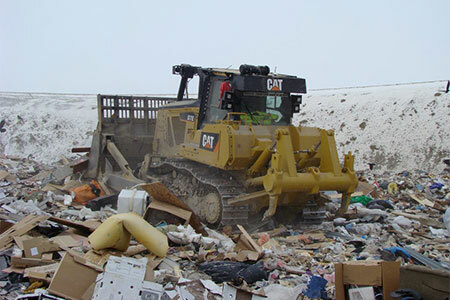 Whissell Landfill Services - Whissell Contracting Ltd.
Our Landfill division has been operating since 1997. We are experienced with compaction of MSW, construction of new cells and liners, asbestos disposal, bio cells and daily landfill operations. We have a diverse equipment fleet and the resources to tackle any new venture. We currently have long term contracts with the City of Calgary, the City of Red Deer, Drumheller & District Solid Waste Management Association. Our expertise is built on more than 15 years of experience in landfill operation and waste management. Further, we train our operators to meet or exceed industry standard for all aspects of equipment operation. Our manager and foremen are Managers of Landfill Operations Certified (MOLO). Training goals include having all operators achieve SWANA’s landfill operator’s basic certification with regular upgrades. All staff are trained in First Aid. We work in partnership with our clients to maximize their Landfill life and ultimately their return on investment in an environmentally safe manner. We seek new ways, technologies and processes to make operations more efficient and sustainable. Our goal is to minimize our impact on the environment to ensure a safe and healthy environment for future generations. We currently have in operation 3 Caterpillar D7E Hybrid dozers that have reduced fuel consumption over conventional dozers by approximately 30%. In addition, we utilize GPS grade control and site management to further ensure we are doing the most to make our clients’ landfills sustainable. We have been working in landfills for a long time, and we understand your challenges and believe that we can help make you more profitable, extend your landfill life and improve your operational efficiencies. That is our track record – partnering with our clients to increase compaction densities and help streamline their operations and increase efficiency and safety through teamwork. That is what “building the best projects every time” is all about. To learn more about our Landfill Services, contact Whissell today.